Latin words and melody from Piæ Cantiones, 1582. English Translation by the Rev. J. O'Connor. Source: Richard Runciman Terry, Two Hundred Folk Carols (London: Burns Oates & Washbourne Limited, 1933), Carol #169, pp. 20-21. Seed of God on earth is sown. Glory carols from the height. Sheet Music from Richard Runciman Terry, Two Hundred Folk Carols (London: Burns Oates & Washbourne Limited, 1933), Carol #169, pp. 20-21. There are 9 stanzas in the original. For the complete Latin text see Piæ Cantiones. There are numerous translations and adaptations of some or all of the Latin verses. 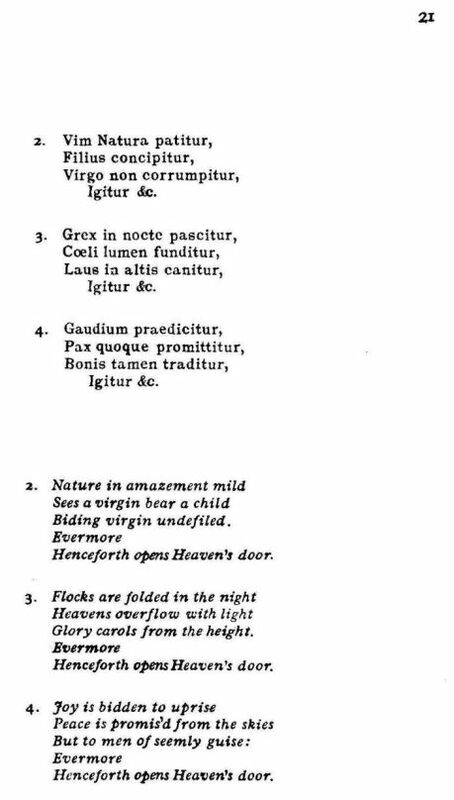 See: Angelus Emittitur, in nine stanzas, from Guido Maria Dreves and Clemens Blume, eds., Analecta Hymnica Medii Aevi, Vol. 45b. Cantiones et Motetten des Mittelalters. (Leipzig: O. R. Reisland, 1904). A single copy of Piæ Cantiones found its way into the hands of Rev. John Mason Neale and Rev. Thomas Helmore in 1853, and from this exceptionally rare volume an immense amount of music was saved from oblivion. 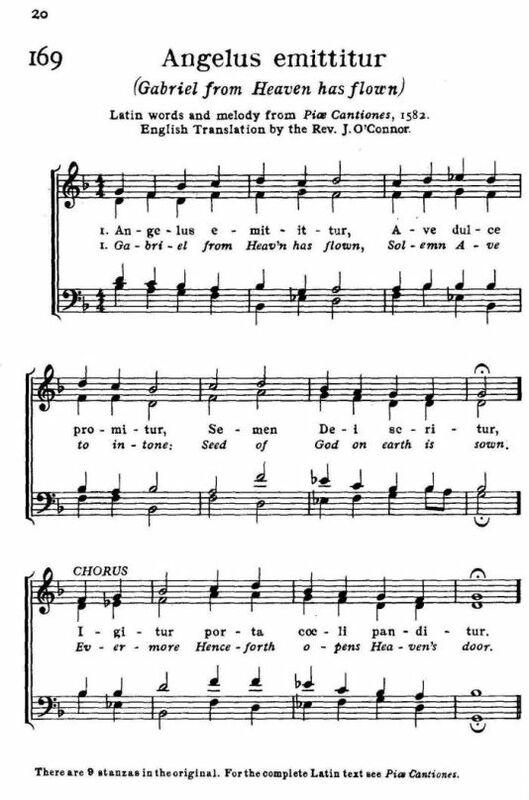 Their translation, Gabriel's Message Does Away, was from Carols for Christmas-tide (London: Novello, 1853). For more information, see Piæ Cantiones.